After breakfast, transfer to airport for your flight to Heho . After arriving at Heho airport, transfer by bus to Taunggyi ( 35 Km – approx: 1 hr driving), the capital of the Shan state and former British colonial hill station and check in at the hotel. After lunch the bikes get assembled and there will be a brief ride around town to familiarize everyone with traffic, Burmese-style. After breakfast at hotel, departure by bus to Kakku, a lesser known but impressive site comprised of several thousand small stupas in the Pa O region. The place is newly opened after the ethnic freedom fighter had entered the legal-fold. 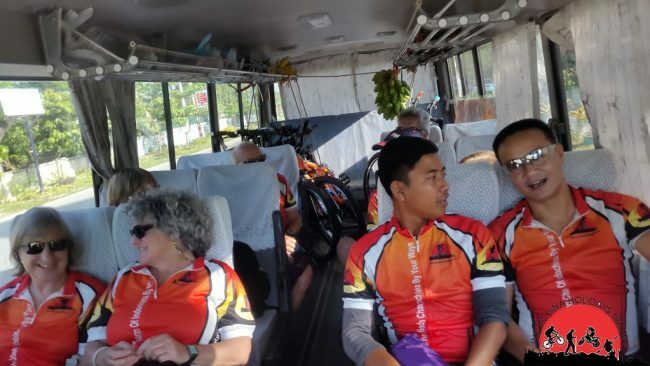 Cycling begins in the mid morning on the bumpy tarred road and bike back to Taunggyi. After lunch, descends down nearly 2000 feet to Inle Lake. We plan to spend the day visiting villages and sampling the spectacular array of traditional handicrafts. You will see the unique method locals use to row their boats, fishermen with their own style of fishing, floating farms and gardens and a handloom weaving cottage with its own showroom. You will visit Phaungdawoo Pagoda which houses the five most revered Buddha Images in the southern ShanState. Alternatively, you may bike to nearby villages to explore more on your own. Today we head north to Pindaya on a road flanked by beautifully manicured fields where much of Myanmar’s product comes from. Lunch in Pindaya and rest for some time in the hotel. Before dinner we will visit the Buddha image filled Pindaya caves and catch the sunset from the hill side. The most demanding day of the tour goes northwest on a recently paved road through mountains and jungle. Bus will transfer you in the early morning to Sakhangyi, a small village hidden in the mountains. We will have a light or picnic lunch on the way in a village restaurant. Then to Kyaukse and continue biking. For those who want to avoid the heavy traffic, the bus will transfer the remaining distance into Mandalay. You can be as active or as lazy as you choose today. We will do a formal half-day tour to the temple of the former royal capital city of Sagaing, a few miles south of Mandalay. During the afternoon you can visit the pagodas on Mandalay Hill or the MandalayPalace both which are just minutes from the hotel. You can also go shopping. Favorite things to shop for are marionettes, wall hangings and antique opium scales and weights. If you cannot stand a day without exercise, you can bike traditionally around outer wall of the MandalayRoyalPalace. Biking out of the city is not fun and you will be transferred out of Mandalay for about 20 minutes to avoid the congested traffic. Bike southward along the superb high-way for about 40km and arrive Kyaukse, the rice bowl during the Bagan period. This thriving small town is assumed to be the birth place of Burmese, according the British scholar G.H Luce. Then, turn right to a by-way and arrive Myittha, a small charming town. Continue to Myin gyan . Today shall be the most beautiful day to bike. The road is typical to the central dry zone. Begin biking across the dry interior of Myanmar. There are a number of places where they have yet to build bridges so we bike through dry riverbeds or small streams. Tonight we stay at a lovely lodge overlooking Mt.Popa, the site of a popular Buddhist temple build on top of a free-standing volcanic plug and home of the Nats, impish gods who can allegedly have the power to make your life delightful or miserable. After hiking to the top of Mt.Popa, it is just a short, easy ride across the desert plain to the Bagan. The area is intoxicating. We have another very good hotel in Bagan, perhaps Myanmar’s most important and impressive historical site. Spreading over 15 square miles on the banks of the Ayeyarwady River Bagan is an enormous, ancient collection of temples and stupas. Some are crumbling ruins. Others have been magnificently restored. Today is reserved for exploring Yangon, shopping, and packing our bicycles. Visit the landmark of Myanmar/Yangon in the morning. A walk through “downtown” Yangon, a diverse mix of faded colonial architecture from the British times, and high-rises built by more recent investors; Sule Pagoda, built in the early 3rd century is a landmark in the city centre. Do your last minute souvenir shopping at Bogyoke Market and visit Karaweik, a royal barge for fantastic photo shot along the “pilgrims” causeway across the RoyalLake with stunning views of Schwedagon Pagoda. After breakfast, transfer to airport for your international flights.